Cleaning the vinyl seats in your car or vinyl furnishings in your home is not a difficult task. For daily cleaning, a simple wipe of the vinyl with a damp cloth is all that's needed. To remove stains and grime, you can use a commercial cleaner or save some money and make your own vinyl cleaner. 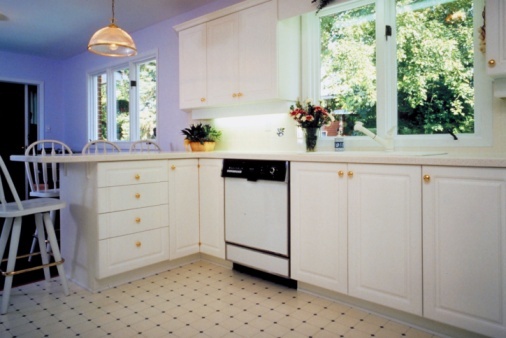 Everything you need to make the cleaner is probably right in your kitchen. After putting on latex gloves, mix 4 tbsp. laundry detergent and 8 tbsp. baking powder in a pot or bowl. Stir the dry ingredients with a spoon. Add 2 cups of warm water to the dry ingredients in the pot or bowl. Stir the cleaning solution with a spoon. Dip a soft cloth into the cleaning solution. Wring out excess solution. Wipe your vinyl surfaces with the soaked cloth. Rinse the surfaces with a clean, damp cloth.